Paul Theroux, the grumpy travel author, complained in The Pillars of Hercules (in which he travels around the Mediterranean clockwise, from Gibraltar to Ceuta), that he had already had enough of Roman amphitheatres by the time he reached Valencia. By that time, he’d barely covered half of Spain, and he still had the whole Mediterranean seaboard to go. No chance of overkill by amphitheatres in Northern Europe though. 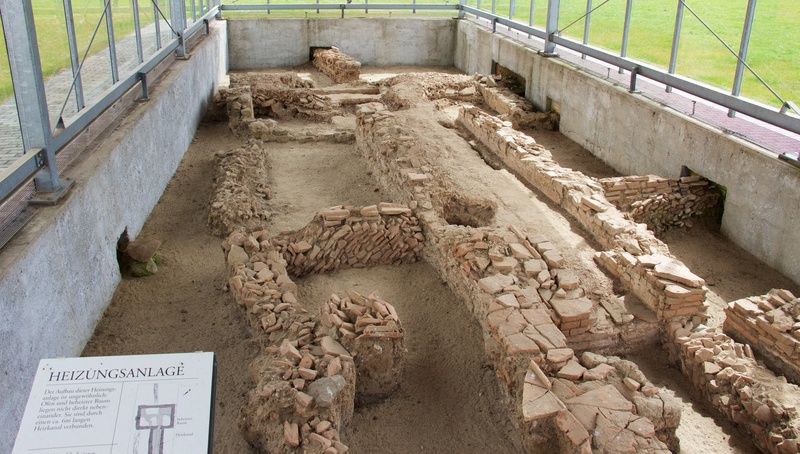 The Romans faithfully maintained their northern limes with army camps (familiar to Asterix lovers) and occasional cities for retired legionnaires, but there weren’t many sites for high-brow cultural entertainment (such as gladiator battling with wild animals). 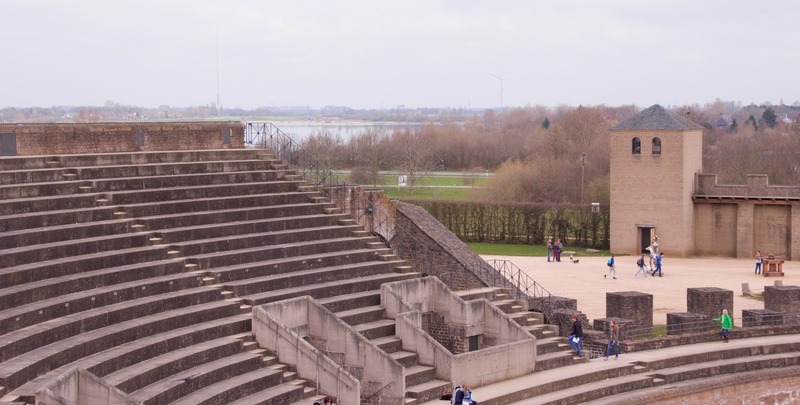 But at Xanten, a small town on the banks of the Rhine halfway between Düsseldorf and the Dutch border, there was an amphitheatre, and what’s more, it’s been reconstructed. 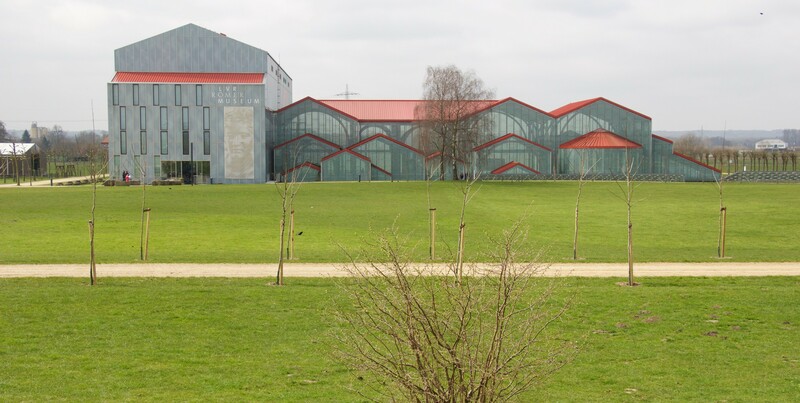 Since the site of the former army camp was discovered in the 1930s, many former buildings have been restored and the park is a huge hit with German and Dutch grammar school classes. School groups get to blow off steam on the army camp’s bouncy castle. North Gate in the background. 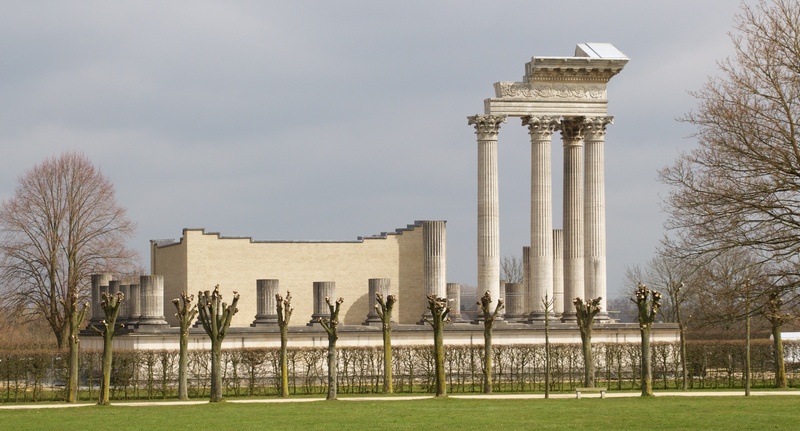 Trajan’s warrior statue at Xanten. Original is at the Louvre. Marcus Ulpius Traianus, or Trajan to his English friends, was one of Edward Gibbons’ Five Good Emperors, all others having done more harm than good to the Empire. 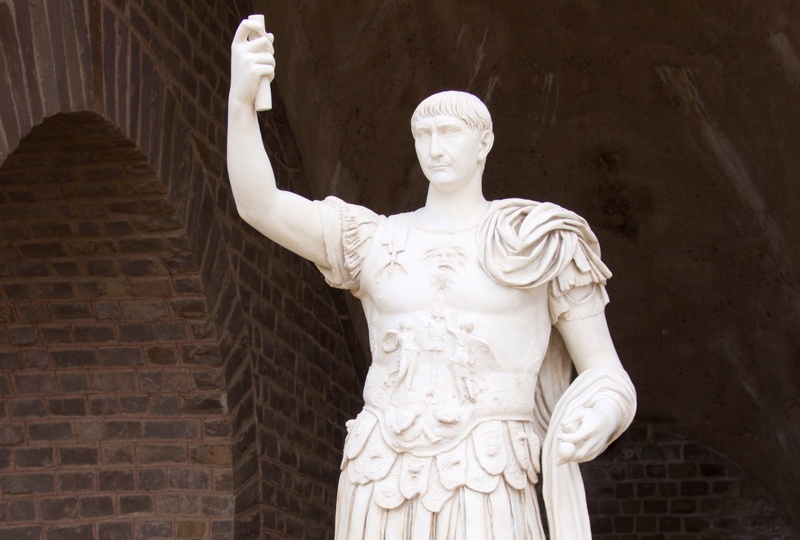 Trajan is not only known for being a Good Emperor, embellishing Rome with a Forum, a market and his self-named Column, but he also took the Roman Empire to its greatest geographical stretch by the end of his reign in 117. The Colonia at Xanten was very much on the limes – the name that classicists traditionally have used for the fortified border of the Roman Empire, but wikipedia says that this use of limes is all wrong: the Romans themselves are supposed to have called it the Munimentum Traiani, or Trajan’s Bulwark – I’m quite happy to go with that too, as it fits nicely with Trajan’s colony on the Rhine! But whatever the politically correct name of the limes on the Rhine may be, its remains are getting ever more attention. German paper Die Welt reported recently that the adjacent countries and regions are nominating the whole stretch, from Remagen (famous with WW2 movie fans) down to where the Rhine meets the North Sea at Katwijk, as a Unesco World Heritage site. I’d be very happy if that happened – as a boy I lived in Wageningen, on the banks of the Rhine, which once was thought to have been the Roman army camp Vada, and our Dutch house is in Oegstgeest, also on the limes and close to where the northernmost branch of the Rhine flows down to the sea. Living right on this historical frontier always made a great impression on me, and I’d love this heritage to get the recognition and publicity it deserves.